Your private chauffeur will pick you up at your hotel at 13:00 in a luxurious Mercedes sedan or minivan and bring you back there again at the end of your tour around 18:30. On the way to Fontainebleau which 1 hour drive from Paris, your driver will give you an introduction to the history of the palace. You will be able to visit of the chateau and its 3 different type of gardens will open up an unparalleled view of French History, Art History and Architecture. With over 1500 rooms at the heart of 130 acres of parkland and gardens, the castle « château de Fontainebleau » can claim to have been a sovereign residence for 8 centuries: Capetiens, Valois, Bourbons and Orleans, all members of French ruling dynasties have lived within these walls. Kings and Queens, Emperors and Empresses have all striven to make their own improvements to the castle built around the central keep.. The first recorded reference to the chateau of Fontainebleau in a royal charter dates back to 1137. The central keep dates from that period. In 1259, Saint Louis established a monastery there. The monastery was to be acquired by King Francis that did impressive extension works in 1528. The castle de Fontainebleau was also where Catherine de Medici gave birth to 6 of her children. The last major building expansion works at the castle were carried out during the reign of King Henri IV whose favourite residence it was after the Louvre. The 18th Century saw the marriage ceremony of King Louis XV and his wife Marie Leczynska at the Trinity chapel in Fontainebleau. Life at the castle de Fontainebleau under the First Empire was closely linked to the rise and fall of the Imperial Eagle. Napoleon did more than anyone to restore the Chateau de Fontainebleau, refurbishing it completely after the Revolution. 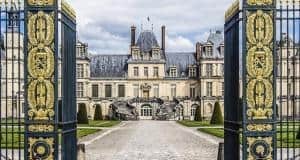 The Fontainebleau castle houses an exceptional collection of works of art representing the stylistic and aesthetic tastes of those who have lived in its apartments. They provide a fascinating art history lesson.